Are these acceptable and low risk? The OFA x-ray clinic I'm investigating use these drugs. Rompum is xylazine which is not used much anymore in dogs and cats. Hopefully MissKiwi will chime in but it tends to have nasty side effects in small animals (dog, cat) from what I understand. Yohimbine is just the reversal of xylazine to make them wake up when the procedure is done. Ugh, no way would I want a small animal clinic to be using Rompun on my pets. It's mainly used as a large animal anesthetic, and it was used on exotics when my class went to the wildlife park, but there are better alternatives like Domitor for small animals. Rompum used to be the go to back in the day. Where I work I have been told the safest thing is valium/ketamine induction maintained by iso. We also use telazol/torb/dexdormator [TTDEX] which is a reversible sedation, as well as dormitor/torb with or without ketamine [DTK], I think either of those would get the job done in terms of getting the x-rays taken. Personally, if the clinic has been using rompum and is comfortable with it I think things should be fine. If you search online you will find people who insist on gassing animals down on iso only, they insist ketamine is bad, they insist propofol is the only way to go. There are definitely better alternatives these days to rompum. OK, this isn't sitting too well w/me. I think I'll pass. Thanks for the help. IMO, TTDEX is the better way to go for this purpose. We use a ketamine-xylazine premix IM for fractious animals in order to get safe IV access... there are definitely hallucinations and nausea. I like telezol. As much as we use it at work, I haven't seen bad reactions in dogs. It can be used IV or IM, and its fast. Would non sedated x-rays be an option? The last time I did OFA rads with Vi (and just did 2 of my friends dogs) no sedation was used. I just checked the box saying they were done without sedation. Scheme will need sedation, she's a wild woman who strenuously objects to restraint. I also put more value in a sedated OFA reading, I think it is more accurate. I think you are see the worst case scenario sedated. Between the non-preferred drugs, and the cost climbing to w/in a hundred from having it done at my own vet, it seemed best to pass. At this point, Scheme is 17 months, I may even hold off until she's 2, and get her permanent evaluation from OFA. I appreciate everyone's input, it's reassuring to have assistance in making decisions. Yeah, I'd wait if you are going to do sedated rads. No point in putting her under twice. I'm just really lucky that Vi will let me do just about anything, even twist and pull for xrays. It does also help being a tech and our training partner is also a tech. Vi will let us do anything to her no matter how weird. Mooresmajestic wrote: Yeah, I'd wait if you are going to do sedated rads. No point in putting her under twice. You're really lucky. My dogs are good for x-rays - two of them I can take rads by myself. But for hip rads they won't relax enough to rotate their hips and knees inward. On my newest addition we just took a VD to get an idea on his hips and he was way too tense to even try to rotate them. I don't think we've ever sent out OFA rads without sedation although most of the ones we've done have been on crazy labs or golden retrievers that would totally not hold still. I did my Border Collie's awake, but at the time I was looking for the reason why he was limping (iliopsoas pull was the final verdict), not specifically for OFA films. I did end up sending them (he pre-limmed as "Good") and I think his hips ARE probably good, but I also think that sedation gives you a more accurate answer. I think it matters more when you're getting a more marginal answer- fair or mild. All mine were done without sedation, though I think they might have gotten better ratings if they'd been sedated. They passed, and that's all I cared about. I was rather surprised when I did Tully (first one I've done), that they could position her without sedation, I'd have thought she'd be too wiggly. But I've come to expect it now. I do think the positioning might be better if they were sedated. With Pirate's, the vet told me they couldn't get his legs into the full stretched position because of the muscling, but that OFA would allow for it. Pi's sister was done with full sedation though (prelims, she was having X-rays done at 20 months old for a limp in front, so her owner chose to X-ray everything. ), and was positioned normally. Eva came back as "Good", Pirate as "Fair". I do think that Eva's hips have better conformation than Pirate's, I don't think it's just positioning. But I think if I was genuinely concerned about hips, I would probably want them done with sedation. I know many people do OFAs without sedation, but I was always taught in school that to yank the legs enough to get great positioning, it would a) really hurt an awake dog, especially if they DID have bad hips, and b) be challenging because of muscles (like you said with Pi, Sarah). I'm certainly no expert, but I see a big difference in those two rads you posted, Eva's kneecaps are right in the center of her knees and Pirate's are off wonky. I actually ran into someone today who was talking about anaesthetizing dogs at the vet I used to use. She felt that non-sedated OFA's were always compromised, and also thought that rompun was definitely not the way to go. 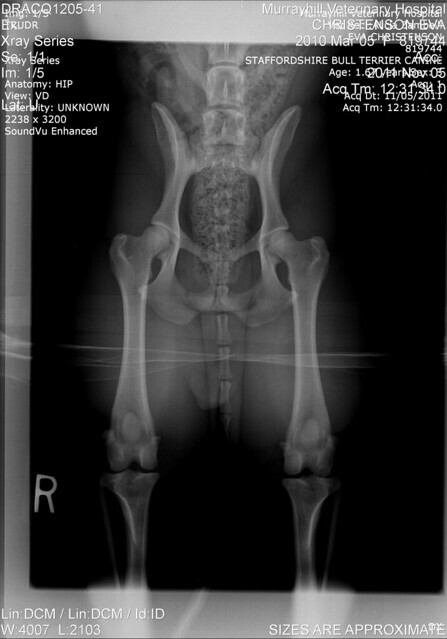 The vet I use does a ton of OFA X-rays (it's out in a more rural area, but a lot of people go there for X-rays, the vet has a particular interest in them), lots of experience with them, and he doesn't anesthesize. I imagine he would if he really couldn't manage the dog, but if they can manage my wild ones, I think that wouldn't often be necessary. But I do recognize that the positioning isn't as ideal. Really think it matters what your exact goal is. I'm not truly all that concerned about HD. We do have a higher than ideal fail rate in the breed, but the truth is that I've only heard of a couple Staffords who were actually clinically affected by HD. In England, they don't screen hips at all (I think they should, but they feel strongly that they don't need to). I think the OFA vets don't take the peculiar conformation of the Stafford's hip into account all the time, so a lot of the "Fairs", should probably actually be "Good". I do like to do the screens to be sure there is no dysplasia present, and to get the ratings done and on the OFA site so that people can see it was done, and it goes into breed stats. Beyond that, I'm really not that concerned. I've certainly heard from people who disagree with this attitude, and want OFA done carefully, or PennHip instead, to breed for improvement. Which is fine, but I'm taking the attitude that we probably don't really need to improve, just to avoid breeding dysplastic dogs. (FWIW, I'd also think long and hard about using a dog who had close relatives that were dysplastic) I think if I had a breed that was more often affected, I might view this differently.